The Heart is an important organ of our body, which comprises of muscles & tissues. This provides the entire body with supply of blood to each & every cell in the human body. In the coronary artery, extra deposition of cholesterol & triglycerides leads to “atherosclerosis” This can lead fatal heart diseases & diabetic conditions. If there is a development of blood clot inside the blood vessel, then there is an obstruction in blood circulation, which can lead to reduced oxygen supply to the muscles, there is distinct possibility of heart attack. Take Pamohrud and stay away from fatal heart diseases. In today’s life to treat the heart diseases is not easily affordable for the common man. Hence Pamosa is bringing to you a very effective remedy for heart diseases................PAMOHRUD! 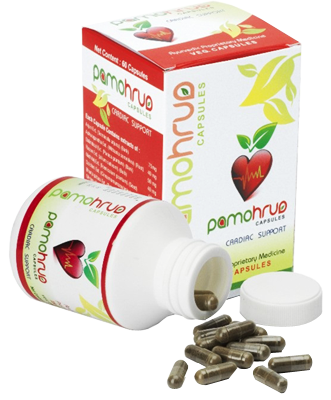 Pamohrud is an effective Ayurvedic remedy which helps to reduce cholesterol ,fat & blood clots. This greatly improves the blood circulation in the human body. It is a effective attribute as a heart protective. It stimulates & leads to a healthy heart. It gives strength to the heart & nourishes the blood. It reduces the oedema, which helps in heart diseases & anaemia. It nourishes the heart & blood quality. It is helpful in heart diseases , anaemia & haemophilia. It stimulates the heart & reduces the oedema. This contains : phosphates, lecithina,nucleo albumin which act like cod liver oil. In an obese heart diseased person it helps to reduce the extra fat. due to its soothing effect it stimulates the heart muscles , increases the blood pressure & reduces the oedema. It stimulates the heart muscles. It maintains the ideal blood pressure. Mainly as an anti toxin effect. It gives strength to the heart & removes the impurities in the blood. It stimulates the circulatory system & heart & reduces the oedema in the body. It is useful in heart diseases, elephantitis,urticaria & rheumatoid arthritis. It nourishes the heart & regulates the blood circulation.